Sometimes it feels like software and IT have a more powerful hype generator than most other industries. Often, it’s a short distance from today inspired catchphrase to tomorrow’s tired cliché. It becomes easy to forget what got us excited and enthusiastic about certain ideas when nothing really changes in the way you run your business. Digital transformation is one of those concepts that could easily result in hype and disappointment. There’ve been too many IT initiatives described as transformative when all they did is provide people with tools to be more productive or make certain processes more efficient. However, digital transformation is real. The visionaries and innovation leaders in many industries are using digital technologies to anticipate and respond to customer demand, collaboratively develop new products, connect operations around the globe in a seamless flow, and enable their people to achieve their ambitions. Even better, digital transformation is not confined to the large enterprises that can commandeer a wealth of resources and whose budgets are unlimited compared to yours. With modern cloud technologies, you can now benefit from the most advanced computing resources available today, but you don’t need to own them. You subscribe to them as a service, using exactly the functionality you want. Unlike can often be the case with on-premise software products, you don’t pay for capabilities that would never make a difference for your business. In the cloud, you find the data storage, networking, information protection, and software applications that can help you run and grow your business and transform it for a digital future. The leading cloud providers also have created powerful arsenals of business intelligence tools to help you make sound decisions and perform reliable planning based on evidence. And, if you need to make sense of masses of information such as data streams from the internet of things (IoT), in the cloud it’s much easier to store, safeguard, process, and analyze them. With Microsoft Dynamics 365 on the Azure cloud platform, modern ERP and CRM capabilities have come to the cloud. You can make use of them in a modular manner, starting with the functionality that’s most valuable, and add others as you move forward. Dynamics 365 integrates easily with your on-premise applications, Office 365, and a wealth of business intelligence resources such as Power BI and the Cortana Intelligence Suite. Digital business transformation is no longer the exclusive domain of the industry leaders. You can embark on your own transformation initiative in the cloud while keeping it real – close to your goals, predictable, and low-risk. 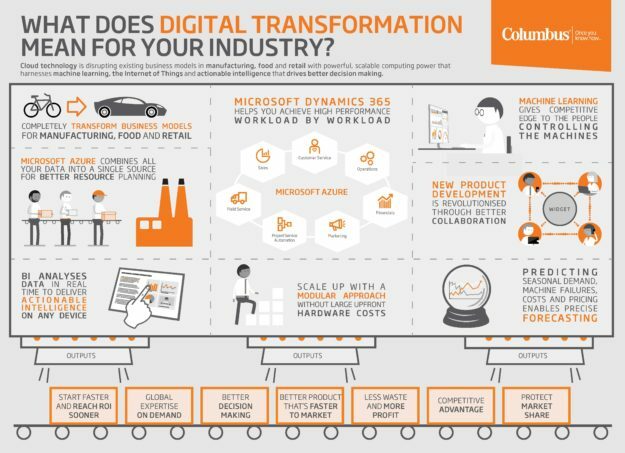 Columbus offers the expertise and complementary business solutions to make cloud-based transformation pay off for you. To find out more about how to get started, navigate to our website to read our e-book, “How to Start Your Cloud Transformation Journey”.